Sarah: Where did you get the bodies? Despite the fact that there’s a cast of well known stars acting in this film, I didn’t like this film so much. Apparently, this successor is of the same level as the original film “Red”. So I’m not going to bother to watch the latter either. Bruce Willis, John Malkovich, Helen Mirren, Anthony Hopkins … You would actually expect this to be a gem of a movie. It’s pretty funny at times (it’s scarce though) and the action scenes are usually excellent. But the story itself was implausible, chaotic and in short ridiculous. The only one whose presence I appreciated the most, was Byung-hun Lee who plays an ice-cold Oriental assassin with a high Bruce Lee content. The biggest minus was the interpretation of Sarah by Marie-Louise Parker. She got on my nerves very quickly with her teeny innocence and the ever-recurring effort she made to be one of the guys. The only thing missing was her jumping around like a little schoolgirl while clapping her hands and being cheerful. The only good scene was when she got stuck in the narrow alley in the chase. For the rest, it was a disturbing irritant element throughout the whole movie. Apparently the film is derived from a DC Comic. That explains the transitions between different parts and also the fact that they travel half the world to solve the case. Not very credible and actually a pretty laughable fact. Anthony Hopkins did his thing the way he always does. To be honest, I think the man actually has the same look and feel in every film. Not very original, but he’s and always will be a top actor. 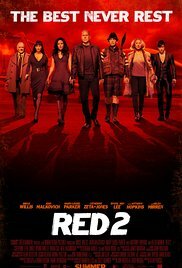 “Red 2” is an action movie with a big comic-book feeling and not so succesful humor. That’s probably the reason why I fell asleep half way and had to re-watch the missed part afterwards.